reBounces Put the Bounce Back in Your Balls! Dan Weger is the Director at Balcones Country Club in Austin, Texas. Dan is a member of the USPTA and also does amazing work with the Special Olympics. It was always a struggle for Dan to balance the quality of practice balls (bounce, specifically) against the cost of always having to buy new balls. Dan has put out recycling bins at Balcones and the members green the planet by pitching in tennis balls, which are then sorted into three classifications: “court worthy” when the bounce is gone but the felt is still court worthy, “ball machine” when the felt is a bit too worn for lessons but ready for a second life in the ball machines, and “recycle” when the ball cannot be further used at Balcones Country Club it is shipped to reBounces as part of our National Tennis Ball Recycling Program. Dan Weger, I’m the Director of Tennis at Balcones Country Club. 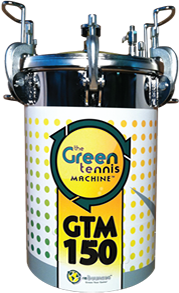 I would recommend the Green Machine to any tennis pro in the United States or the world, I mean it saves your cost of buying balls, and it provides good balls to your members for the clinics and classes. 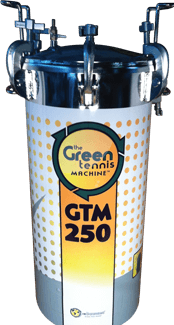 I started using it about 6 months ago, and you know, we like most clubs our tennis balls were somewhat suspect especially in our clinics, and now we’ve got perfect balls all the time for all of our classes and clinics. As any tennis pro knows, you try to stretch those balls out as long as you can, and just another week, one more week and then they just get so bad that everybody is laughing at you. So, we don’t have that problem anymore. To be honest almost zero, like I said, we have our members donate their balls to us for recycling, we have league balls, the U.S.T.A. teams give them to us, so that we always have a constant influx of good balls to re-pressurize. [The members] They like it, they really like it. Everybody has become involved with it, even if the balls are no good, they bring them in we have recycling containers that they put the balls in. And then if we can’t use them anymore, we ship them off to you guys for recycling there. In fact it was just last week, I had a bunch of the orange balls that just really were no good anymore, we thought we would give it a shot, and it brought them all back to life. So, we are using them back in groups again. The year around program, we have got junior program, starting at age 4, all the way up to senior citizens. We also do Special Olympics, and things of the sort for handicapped players. We won the statewide award for our participation in the Special Olympics. We host the area games here at Balcones every year. So they recognized us for that.